Chief Rabbi Yisrael Meir Lau is a tall man who brightens any room with his Torah depth and stature. He is viewed as a someone who has achieved wondrous feats! From surviving the Holocaust and continuing on the Rabbinic dynasty that he hails from, to serving as the Chief Rabbi of Israel and now Tel Aviv—he remains a legendary figure to all of Jewry. On the complete opposite spectrum stands the legendary Lakers Center, Kareem Abdul-Jabbar. Born Ferdinand Lewis “Lew” Alcindor, Jr., he had a prolific college and NBA career becoming one of the best basketball players of all time. In 1971 Lew Alcindor converted to Islam and changed his name to Kareem Abdul-Jabbar. To the naked eye it would seem that the only thing he shares in common with Rabbi Lau is that they are both luminous figures. And yet, these two men—one a Jew and another a Muslim—are eagerly looking forward to meeting one another this July in Israel! The former NBA star is making a film about none other than World War II, and will honor the final wish of his father. You see, Ferdinand L. Alcindor Sr., had one dying wish. He requested that his son visit Israel and meet the little boy that he personally rescued from Buchenwald and turned into a prominent Rabbi. This Rabbi is none other than Rabbi Lau! As someone who grew up in Los Angeles and followed the Lakers, I never thought I’d see these two figures mentioned in the same sentence—let alone meeting in The Holy Land! 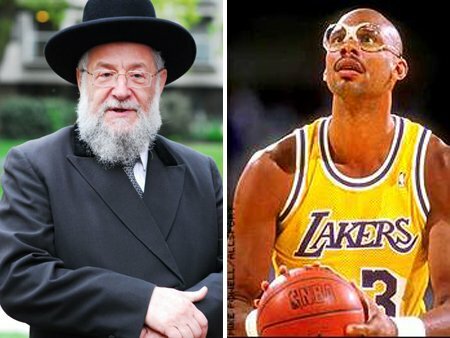 However, after reading about what Mr. Abdul-Jabbar intends to do with his film and his visit, I look forward to seeing these two legends of their respective fields work towards educating the world about the horrors of the Holocaust.